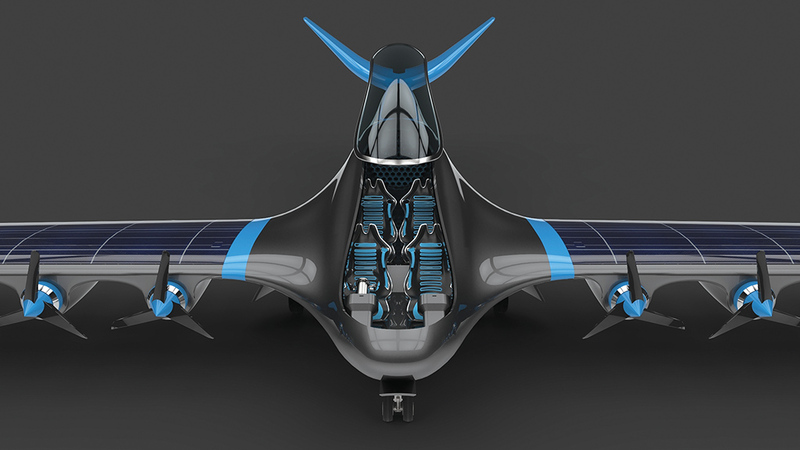 HES company with experience producing fuel-cell propulsion systems for military unmanned air vehicles has unveiled plans to develop a hydrogen-electric four-seat aircraft. With significantly longer range than battery-powered electric aircraft, the Element One is designed for regional flights between country towns. The Element One concept combines hydrogen fuel cells with distributed electric propulsion to enable the aircraft to fly up to 500 km with compressed gaseous-hydrogen storage and up to 5000 km with liquid-hydrogen storage, says Taras Wankewycz, HES managing director. HES has been developing compact, lightweight hydrogen fuel-cell propulsion systems for the past 12 years, mainly to extend the endurance of electric UAVs. “A lot of manufacturers look at retrofitting this into battery-electric UAVs, which is challenging as hydrogen takes a lot more space. HES is developing a next-generation UAV concept that fits around its propulsion system, and sees the opportunity to apply the same technology to manned aircraft. What makes this possible is distributed electric propulsion, indeed Element One has 14 electric motors housed in nacelles under the wing. There is room for us to replicate the drone propulsion system across the wing of the aircraft, so we have multiple motors versus one big one. That provides redundancy for safety, because if one fails, there are 13 others or more. 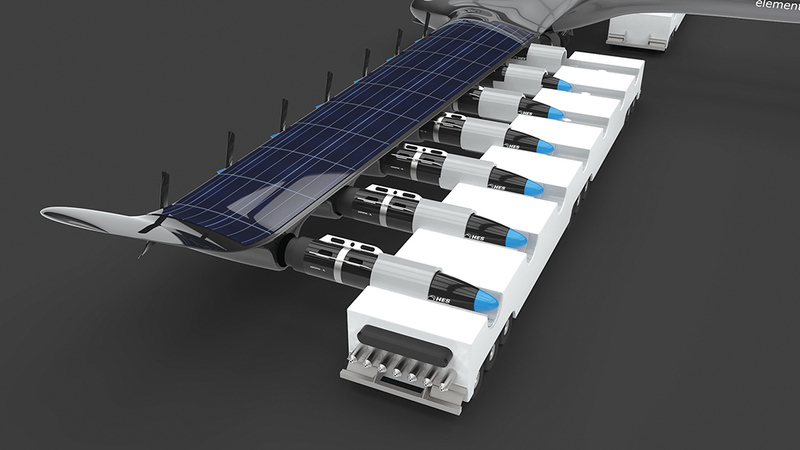 It is not only propulsion that is distributed, but also energy storage, as each motor has its own fuel cell and hydrogen tank in a swappable nacelle. “There is a limit to how much hydrogen you can store on an aircraft because it takes up a lot of space in the fuselage. But we split it into parts and put one tank behind each motor,” says Taras Wankewycz, HES managing director..
BMW developed a liquid-hydrogen-fueled car in the mid-2000s but hit the problem of long-term storage and the loss of energy through hydrogen boil-off, he says, so HES has developed the swappable module concept, combined with automated refueling, to minimize the time between production and consumption of the hydrogen. The propulsion module—tank, fuel cell and controls—is designed to slot into the back of the motor. 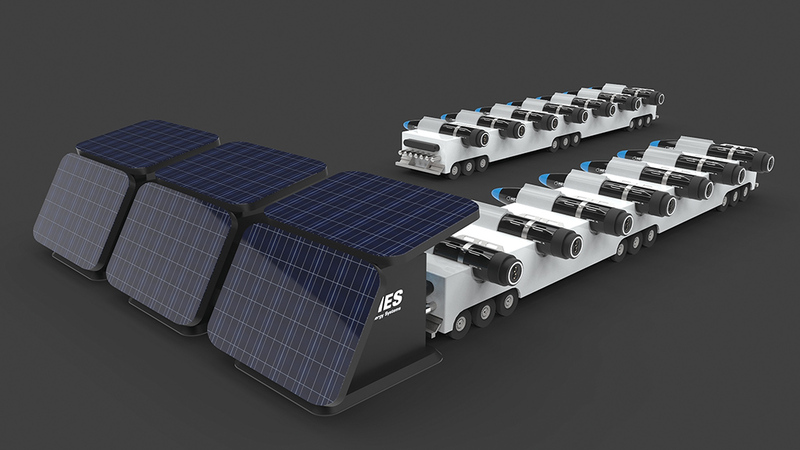 When the aircraft lands, an automated ground vehicle (AGV) will drive up, collect the spent modules and drive them to an on-site hydrogen production facility for refilling. Meanwhile, another AGV will drive up to the aircraft and slot in refilled modules. This will enable the aircraft to be refueled and turned around much faster than the time it takes to recharge a large lithium battery pack, says Wankewycz. In HES’ concept, hydrogen will be produced locally at the small country aerodromes between which the Element One will operate. Today, most hydrogen is produced from natural gas, which is a fossil fuel. In HES’ business model, on-site hydrogen production will be powered by renewable energy from wind farms or solar parks adjacent to the aerodromes. “It’s 100% zero carbon emissions from production to consumption,” he says. HES is working with hydrogen-generation companies to look at technologies to accelerate refueling and reduce the energy required to produce hydrogen. “One company has developed a way to produce compressed hydrogen without an external compressor. That’s a big deal,” Wankewycz says. An on-site facility would “trickle-produce” hydrogen throughout the day, ready for refueling. “Hydrogen production can be slow, but the AGV can plug in and fill up fast. We decouple the production from refueling,” he says. HES has teamed up with French flight-sharing startup Wingly, which offers leisure flights in France, Germany and the UK but is looking to expand into town-to-town travel. “There is a tremendous need for inter-regional transport between secondary cities,” says Wingly CEO Emeric de Waziers. Wankewycz notes that the all-electric Element One will be quiet, avoiding creating a noise issue at these remote airfields. The company is looking for partners in Asia, where air travel is booming, as well as in France, where there is a strong aviation R&D ecosystem “and a big push for emissions reduction” with several companies involved in developing a hydrogen infrastructure. “Europe is the biggest proponent of climate solutions, but we are looking at other options, even China,” Wankewycz says. This entry was posted in News and tagged aircraft, electric, Element, HES, Hydrogen, one, Regional, Travel, Unveiled. Bookmark the permalink.